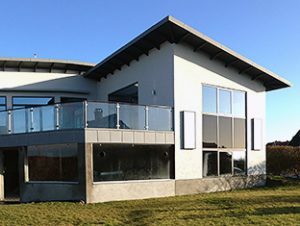 SolarVenti’s solar home ventilation options mean you and your family can live in a home that prevents asthma, mould, and dust mites. It means you can live in comfortable temperatures all year round without expensive bills from air conditioners and electric heaters. And it means a brighter future for your children as we embrace solar-powered innovations to reduce your household’s greenhouse emissions. Any parent who has a child with asthma know how scary and concerning it can be. According to the Australian Institute of Health and Welfare, around two and a half million Aussies – or 11% of the total population – suffer from asthma. Living with asthma means it is critical to remove as many triggers as possible from the air. From dust mites, animal dander and other airborne pollutants. The SolarVenti ventilates the home by pushing in fresh natural air from outside. Before the air enters your home, it is filtered from any airborne pollutants in order to push purified, allergy-trigger free air through your home. Bad odours not only disturb us, but it also disturbs our pets too. Wet dog smell isn’t the most welcoming odour for your home. Have you ever wondered why your dog stinks right after a bath? Microorganisms like yeast and bacteria quietly live in your dog’s fur, and as long as the fur stays dry, there’s little odour. But when your dog takes a bath or goes for a swim, the water causes the release of stinky compounds. Extreme malodours such as from urine and faeces odours also can remain in the air even after cleaning. This can represent an unhygienic environment and indicate a risk of disease. The SolarVenti ventilation system pushes fresh, dry, filtered natural air into the space and forces out old, smelly, stale air that contains animal hair, humidity, and other airborne impurities to leave you with a clean smelling home. SolarVenti ventilation systems can be installed to ventilate your whole home. SolarVenti can also be used to keep a “container home” rust free and at a comfortable temperature. Transfer cool air from the shaded side of the house to cool the living area, or warmed air from the solar panel to heat the house. Controlled by a variable thermostat fitted in the house, for completely automatic operation, so you can set your own comfort level. The SolarVenti will then be running all day, every day to maintain this comfort level. You can cut household air-conditioning costs to just a small fraction, because air conditioners will run more efficiently, and on most days, won’t even be needed! This is also a great option for holiday homes that are often locked up for the majority of the year. Whether you’re simply trying to replace stale air with fresh or you’re completing a project that exposes you to fumes, you can ventilate a room without opening any windows. A windowless room can serve many purposes. Often created in a previously unused space, it can become a valuable and much-needed home office, sewing room, workshop, laundry room or bathroom. It can create a drying room or drying cupboard. Health and safety considerations mandate some type of ventilation, and many building codes have very specific requirements. 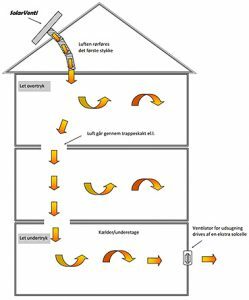 Several simple strategies and innovations in ventilation equipment let unused space become a functional area in your home. If you have turned a room of your house into an art studio, hair studio this is extremely applicable. You don’t want to open a window and have the wind draft disturb you, but ventilation is necessary to remove the airborne toxins from the area. The SolarVenti ventilation system uses positive input ventilation to ventilate a space without causing a draft or “breeze” that might disturb you. When the sun shines just a bit on the panel of the solar air collector on the sunny side of the home or on the sun-faced roof, the air very quickly becomes very hot inside the panel. At the same time, the panels solar powered fan begins to blow the filtered, dry ventilation air into the house. The air – which is blown into the house creates positive pressure – pushes the humid and old air out through gaps or opening outlets in the kitchen or shower/bathroom extractor vents. It is the location of the opening ventilation outlets that determine how the ventilation air moves through the house. A HEALTHY home, a COOL home in Summer, a WARM home in Winter, a DRY home all year round, a GREEN home and SAVINGS on your electricity bill. What more could you want from your SolarVenti Ventilation System!